Okay, so I realise this might not me the most glamorous of subjects, but there's no getting away from the fact that in less than a month I turn 35, and although that is by no means ancient, I can't help but notice my poor aching joints are starting to give me a bit of grief. Now whether I was putting some cosmic vibes out or probably, more likely, moaning about it on twitter, I was contacted to see if I'd like to try out a joint relief gel called Regenovex. Regenovex contains specially advanced formulation with two key ingredient components. It contains a uniquely derivedGreen Lipped Mussel from the sea between the North and South islands of New Zealand, this natural marine oil is extracted from these Green Lipped Mussels using a patented proprietary process to form what we call Bionovex Oil® (a very pure and highly concentrated form of omega 3 fatty acids), and the formulation also contains hyaluronic acid (HA). HA is naturally found in the body and it forms a key part of the synovial fluid which lubricates and cushions the joints – so it is really important. Research reveals that for women the average age our HA naturally drops off in our body is 39 years of age, and is earlier for avid sports enthusiasts. HA, despite naturally forming in our body, we cannot obtain it from our diet, so we you need to take a supplement or use a gel of HA to obtain it. 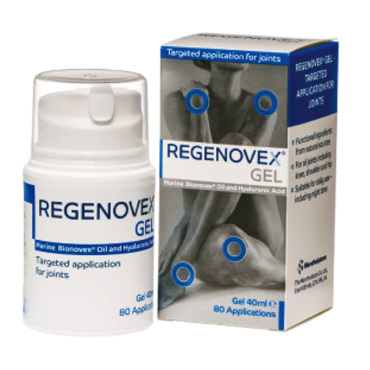 Regenovex contains a very high grade quality of HA to help lubricate the joints by forming this part of the synovial fluid. So, I actually received this gel back in October, but I haven't blogged it sooner because I wanted to give it a really good run to see if it actually does work. On my first use, the gel was easy to dispense and comes out in a thick, yellow/brown paste. I've got to admit, it's smells pretty potent, there's no denying it's made out of mussels. It certainly smells like the sea, with an underlying fragrance. It's not the nicest of smells, but this is not a moisturiser, this is a treatment. I applied the gel to my particular problem areas, the knees and lower back. The gel was easy to apply and absorbed quickly, there was no residue or transfer to my clothes either thankfully. I of course, due to the smell, had to wash my hands straight away. I noticed more so on my back, a warming sensation, which was quite pleasant. This wore off quite quickly though. I've used the gel over the course of a month now. Not every day but when I've had joint pain and I can honestly say it does alleviate the discomfort, it just eases the pain and stiffness which is fab. I was kindly sent two tubes so I gave one to my parents who both suffer with joint discomfort and they too noticed a difference. Overall I'm really impressed with the product, it was easy to use and there where noticeable results, so hooray!